I met Ruth in the Lobby of the Hotel Principe in Vasto. Hotel Principe is one of three exclusive hotels which PWT Italy are using for the first week of the 5+5 2018, and only 100m from the beach and sea. She goes on to explain that her 28-year-old daughter is here running W21 whilst she is running W60, with 2 wins from 4 races so far. Her 87-year-old father is here too taking part and one of her two brothers, together with his family. Dominik Humbel is 10 years younger than Ruth and was part of the winning Swiss Relay team at the 1993 WOC in the USA. Ruth’s younger brother by two years is Achilles Humbel, who was one of the key organisers of Swiss O Week in Zermatt, 2014. She really is part of an Orienteering Family. 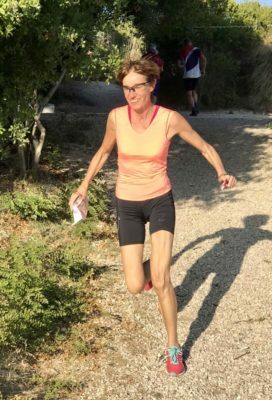 She is perhaps too shy to say she went on to get 3 bronze medals herself from the Relay at WOC and a best Individual placing of 4th from Thun in 1981 at her home WOC. She stopped running for the national team in 1987 with her last WOC when she was 30 years old. ‘Was it always easy to race for you?’ In Hungry and France at WOC I missed one control and it was really frustrating. ‘Were you ever a professional Orienteer?’ No, I was always studying and then working. ‘When did you get into politics?’ When I was 24 and thought I might not run again, I was elected into the District Canton Parliament of Aargau. I was young! I was elected to the National Parliament in 2003. My Canton of Aargau elects 16 members to an Assembly of 200. ‘Did you ever want to go back and run in the Swiss National Team again?’ In 1993 I won the Swiss Long Distance Championships because I was angry! I was 7th or so in the National Rankings but I was made to start first because I was old and no longer in the National Team. I wanted to show them. And the selectors became nervous as they had to offer me a place on the WOC team to the USA, as it was a selection race. ‘How much Holiday Orienteering are you doing this year?’ ‘This week now and European Championships in Ticino in May. I try and do a week or two each year. I did Swiss O week two years ago in St. Moritz and I will be in Gstaad next year for SOW 2019. Do you prefer the open or the forest races this week?’ ‘I prefer the forest but I think the Town races this week have been great because they are so small and narrow, you really have to read the map carefully, otherwise you get lost. I did on Day 1! ‘And why are so many of your clubmates here?’ ‘Well we have about half the club here, 70 or so people. OLG Cordoba. It is the first time we have had a Club Holiday like this. When we helped out at Swiss O Week, the club got money and we used it to help pay to come to Italy. It is good we can come out, especially for the Juniors, as we have a lot of similar aged Juniors who can compete against each other. Many thanks Ruth for talking to us and Good Luck for Stage 5!